All ready for Ballymote Heritage Weekend talk on Monday evening. Presentation was way too long so a spot of skilful surgery performed has it around 45 minutes. The title is Lawlessness Prevails everywhere: South Sligo 1918-1921. Another draft of book finished. The news that footnotes are included in the 70,000 word limit was a disappointment but more surgery has resulted in 80,000 words. Last draft will start next week. Anybody want 10,000 spare words? The Yeats Summer School is on in Sligo at the moment, two talks each morning. I hope to catch at least one morning's talks early next week. Also an afternoon in Sligo library looking at photographs for the book and a newly discovered document relating to the civil war period found in the roof of a house. Nice to get away for a relaxing week-end. A great night for Sligo Rovers. A 0-0 draw in Ukraine against Vorskla Poltava in the third round qualifying of the Europa League. The second leg takes place in Sligo next Thursday evening. A great chance to progress to the next round. 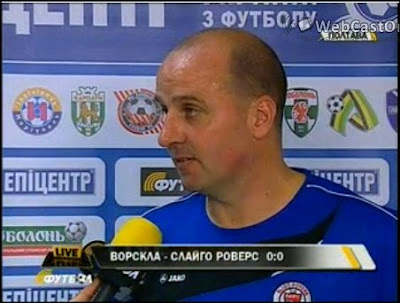 I watched most of the match on Ukrainian TV on the computer having followed a link on the Sligo Rovers twitter. What did we do before the internet? I must watch more in Ukrainian, a great commentator, never got too excited, had a little difficulty with some of the Sligo names but then try Iarfhlaith Davoren yourself. Great not to be told what to think by commentators. The funniest thing about the interview was that Cook who has a strong Liverpool accent spoke especially slowly and clearly though his answers were translated by the interviewer. He doesn't do that for RTE! Well done Paul. Well done Sligo Rovers. I'm going to write a poem about the epididymal cyst excision. No way, poems should be about flowers, cute landscapes and fathers on the bog. I don't care. I was thinking about it waiting for the anaesthetic. Great images came to mind. There's not many poems about male medicine procedures. No wonder. We are men after all! Operations just part of what happens. Procedures not operations. There are some hospital poems here. In surgery like poetry words are vital. The right word in the right place. A stitch in time. Ha Ha. Stop! This will be a serious reflection on the invasion of private parts and . . . They'll think it was written by a woman!
. . . and the terror of the strange lump. You're straying across gender boundaries. Ouch! Easy with the italics, you're confusing me. Perhaps a bit of humour. Surgeon was a Fitz, one of the Normans, maybe a reference to their skill with blades. I can't stop laughing. So how is the distempered part? Fine. Recovering. doesn't affect the brain. A few days complete rest? You must be joking. I've a book to finish. Well actually it's finished, just too long. Ah some excising needed! Wield the scalpel. I was afraid to ask earlier but what exactly is . . . The 22nd annual Ballymote Heritage Weekend takes place next weekend, Friday 29 July to Monday 1st August, in the Coach House Hotel, Ballymote, Co Sligo. 8.30 Official Opening by Peta Taaffe. 9.00 am: Outing to Foxford Woolen Mills and Turlough Park Museum. 2.00 pm: Outing to Glenview folk Museum, Ballinamore. 9.00 am: Outing to Rosserk Abbey, Downpatrick Head, Céide Fields. Should be a great weekend. I hope to make the Eva Gore Booth lecture on the Sunday. My own talk is nearly finished (I hope), plenty of slides in my presentation with some great pictures of south Sligo taken by members of the Bedfordshire Regiment in 1920/21. Hope to make the words as interesting! Desire, when written in the early morning dust of a suburban squat is a sweat-driven afterthought, filled with the stench of stale coffee and cigarettes. Write it in ink and it may be legally binding. Write it in dust and it will be blown away on the wings of a curse. These may be shallow waters yet we chase these Lorca/Cohen-esque visions of attic bound lust as if they are our life blood. Desire tastes best under a thin sliver ...of dust. It implies a narrative filled with lust, love, limpness and loss. Little death and a big dearth; It’s more than the individual; there’s a societal longing in the dust of ages, be it through ignorance, nostalgia, hopelessness or even recreation. There’s a hunger to destroy a present that doesn’t fit. And a future that won’t. There’s a past that excuses, a path that justifies. 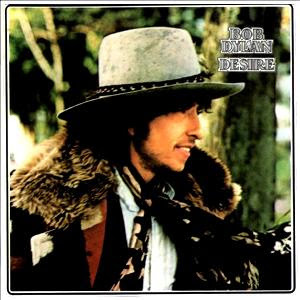 Filled with Desire and Dust. Abridged, the poetry/art magazine is looking for submissions for its Desire and Dust issue. A maximum of 3 poems may be submitted of any length. Art can be up to A4 size and can be in any media. It should be at least 300 dpi. Submissions can be emailed to abridged@ymail.com or posted to: Abridged c/o The Verbal Arts Centre, Stable Lane and Mall Wall, Bishop Street Within, Derry BT48 6PU. It's not as chaotic as it might appear. Herbs in the foreground, borage, fennel and feverfew prominent. Some Sweet Pea next and the end of the Foxgloves. An old climbing rose from Sligo entwined with Woodbine on a arch. Some clematis on the right and willow at the back. The annual celebrations of the life and writings of World War I poet Francis Ledwidge will take place on Sunday 31st July, the ninety fourth anniversary of his death. Two events have just come to my attention and you can actually attend both. There is a wreath laying ceremony and poetry reading in the National War Memorial Gardens, Islandbridge, Dublin at 12 noon. The guest speaker is the long time custodian on the War Memorial Park, David McFarlane Johnson. This event is sponsored by the Inchicore Ledwidge Society. Then at 5.30 in the evening the Meath celebration takes place in Slane Castle on the banks of the River Boyne, home to the Conyngham family since 1701. The event begins with a Reception in the splendid Entrance Hall at 5.30pm. sharp. 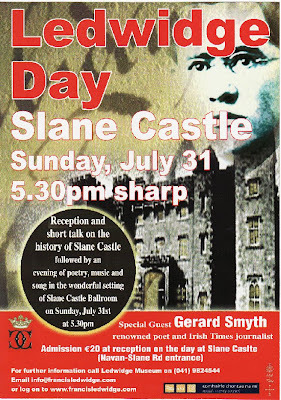 This will be followed by a short talk on the history of Slane Castle. The Special Guest is Gerard Smyth, poet, Irish Times journalist and Aosdána member. The title of Gerard’s talk is ‘It must be lovely down in Wilkinstown’. On sharing common ground with Ledwidge, the talk will link Ledwidge’s love of the bog of Wilkinstown, Lizzie Healy and Gerard’s own roots in this rural Meath village. 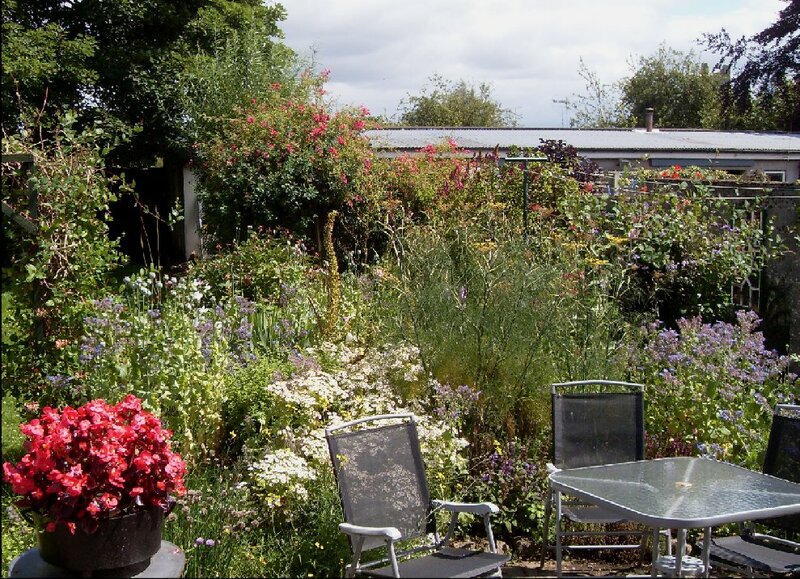 Gerard spent the summers of his childhood and teen years there with his grandmother on the farm, including working on the bog, and wrote his first poems there at age 17. 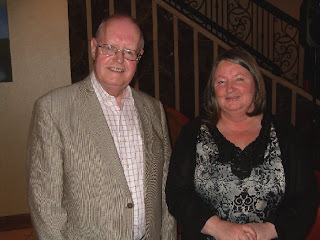 Frances Mulley, international poetry reader from Belfast will read and also from Limavaddy, Co. Derry, Bobby Forrest will sing and recite some Ledwidge poems. From Drogheda, Michael Holohan, Composer and Aosdána member, together with Miriam St Lawrence mezzo-soprano will perform for the first time Michael’s composition of Lament for Thomas McDonagh. Classical Flautist Julie Maisel-Doyle will perform and poet Susan Connolly will read her poem on Francis Ledwidge. Traditional Irish music will be provided by a very talented group of musicians from North County Dublin. Battle of the Books done and dusted, Swift Festival finished and filed. 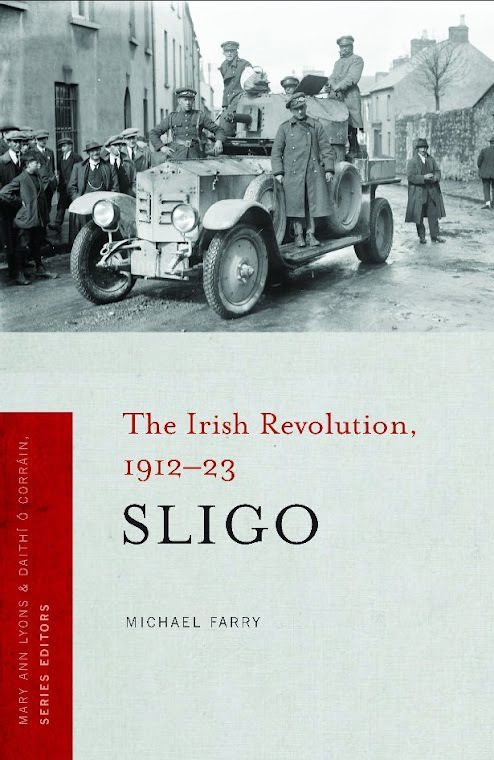 Second draft of Irish Revolution Sligo book done - only 3,467 words too many- and first draft of talk and presentation at Ballymote Heritage Weekend done. So a gap to have a quick look at how preparations for Boyne Berries 10 are going. Submissions, prose and poetry, coming in with a remarkable number of writers obeying the rules - maximum of three poems, attachment and in body of email, bio and postal address included. We hope to make this 10th issue and its launch special. We haven't finalised plans yet but we are hoping for a larger format page, a colour cover and some colour and black and white pictures, images, illustrations inside. There's still time to submit. Deadline 31 July. Check out the guidelines here and please follow them! Did you see the headlines? A politician makes a joke in the Dáil about another politician. Great, it's nice to see them having a bit of a laugh for a change. Well not exactly. It didn't go down well. Oh! But the media, the newspapers, the stand-up comedians, the sitting-on-bar-stools comedians, the talk show hosts, the talk show guests, the chat show hosts and everyone else in the country are always making fun of politicians and calling them names. I know but this was different, I think. How different? Was it satire? Can I use it in the Battle of the Books next year? You better not. Not exactly satire. But I'm not sure how it was different. A bitter public attack on a fellow politician using Dáil privilege? No, it wasn't even public. Heard by accident. What! A casual aside! I'd better be careful. Big brother may be listening. One member of the Senate who failed to get elected to the Dáil at the recent election thinks that such comments "indicate that a culture of sexism still exists in the Oireachtas". Right, so all men are damned because of one joke by one man. Surely that's sexism! No way. Haven't you realised yet, you muppet? Sexism only works one way. for their hour to come again. Two extracts from works based on (I hate that phrase inspired by!) the holy well on the summit of Tullaghan Hill near Coolaney, Co Sligo, Yeats' play At the Hawk's Well and a poem from my chapbook The Hawk's Rock which accompanied Conor Gallagher's exhibition of the same name last summer. I mention this because I had an email some time ago from the creator of a website called Voices from the Dawn on the folklore of Ireland's ancient monuments. It seems a well designed website with some very good content, far better than some of the rubbish on the internet about ancient Irish monuments, ancient Celtic gods, fanciful theories and Tara. This site even has footnotes and references! Well done Howard. 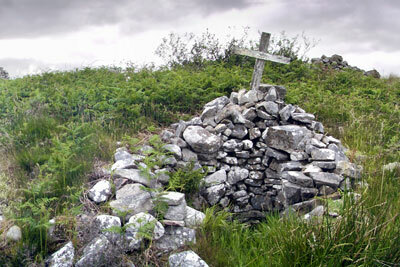 The Tullaghan well page, from which the picture above is taken, is here. As a result of a post about the Keash, Co Sligo, UIL banner I was contacted by some people in Ballinacree, Oldcastle, Co Meath who have a similar banner by the same artist, Samuel Watson. Their banner is in better condition and has been in the possession of the community at Ballinacree since it was bought in 1911 and often used in parish events. They have just published a booklet to celebrate the centenary of the banner and launched it in Ballinacree last Friday evening. I attended the launch, a great celebration of a vibrant local community proud of its past. The banner was on display and experts talked about its iconography and its significance. Noel French of Meath Heritage Centre put the banner in its historical context. It's interesting to compare the banners. 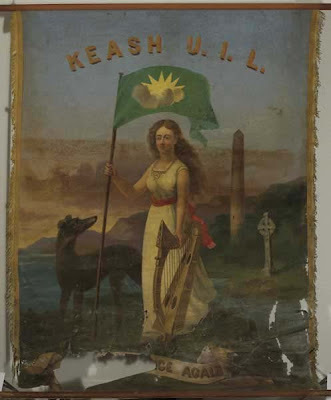 The Keash one (below) is said to have been bought for the 1798 centenary while the Ballinacree one was bought in 1911. 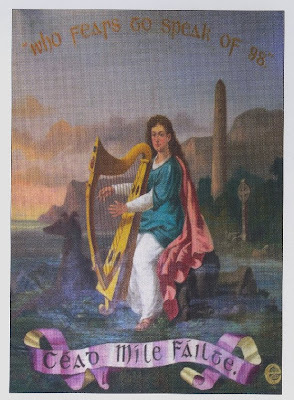 It appears that the lady representing Ireland had become tired of standing around waiting and has dumped the flag, changed into something more suitable for outdoors, sat down and is giving us a tune on her harp. The Irish wolfhound likewise has settled by 1911. Little did they know what history was about to throw at them - World War 1, 1916 rising, War of Independence, Civil War. This seems like a great opportunity for unpublished novelists! 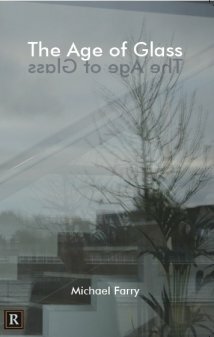 The inaugural Irish Writers’ Centre Novel Fair for first-time novelists will take place on March 10th 2012. The Novel Fair aims to introduce up-and-coming writers to top Irish publishers and literary agents, giving novelists the opportunity to bypass the slush pile, pitch their ideas and place their synopsis and sample chapters directly into the hands of publishers and agents. A judging panel of experienced industry professionals will be asked to select a shortlist of successful entries, presented to them anonymously. There is no limitation on style, genre, or target market, the only requirement being that the writer has not published a novel before. Publishers and agents will be invited to come along on the day to the Irish Writers’ Centre and meet these writers in person. Each writer in attendance will have a stand at the fair with copies of the synopsis of their novel, the finished novel itself and biographical material. Representatives from Penguin Ireland, Transworld, O’ Brien Press, Lilliput Press, Hachette Books, Liberties Press, Little Island and Arlen House will be present on the day. Literary agents such as Marianne Gunn O’ Connor, Yvonne Kinsella, Emma Walsh, Ger Nichol and Paul Feldstein will also be present. This is an incredible opportunity for first-time novelists. For details and how to enter please see the website. On Wednesday evening last the June winners of the Lonely Voice Short Story Introductions read their stories at the Irish Writers Centre. I'm not a great fan of short stories having been overexposed to Frank O'Connor, Seán O'Faoilean etc in younger days but I enjoyed the readings. The judge for the month was Leo Cullen and in his introduction he stressed the need for audacity in short stories. The four we heard had audacity. I loved the gradual accumulation of details in each story, the slow build up and revelation of the full picture or almost the full picture, there is always a question afterwards, Why? What? Who? 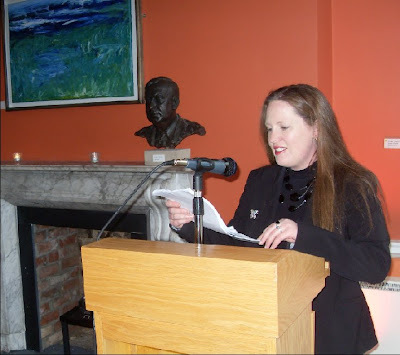 The reason we were there, of course, was that one of our own was reading, Orla Fay from Boyne Writers Group. Her reading of her story Safa was great, confident and clear. It had the same build up of information and details but had it own voice and and its own uncertainty. We had heard and commented on an early version of the story at the group. Great to see she had taken our advice!!! Above: Orla reading. 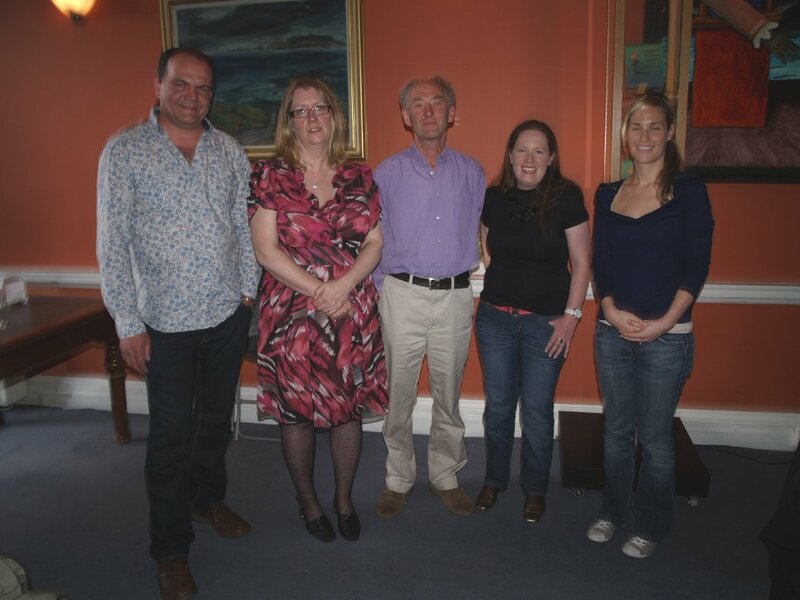 Below the four readers, from left: Guy Barriscale, Deirdre McClay, judge Leo Cullen, Orla Fay and Sarah Gilmartin. Here's a poetry competition you might otherwise miss. You don't often come across poetry and agricultural shows but this one is part of the annual Tullamore Agricultural Show. Full detains of the poetry guidelines are listed under the "Art and Photography" pdf link. The Rules & Conditions are fairly standard: 40 lines in length. €5 entrance fee. The name of the entrant must not appear on the entry itself. Entries must be in English and not previously published in any form (including appearing on the internet). The competition is open until 22 July 2011. There are sections for under-17 and Senior (which presumably means over 17.). The judge, is Connie Roberts, Adjunct Professor of English, Hofstra University, New York. 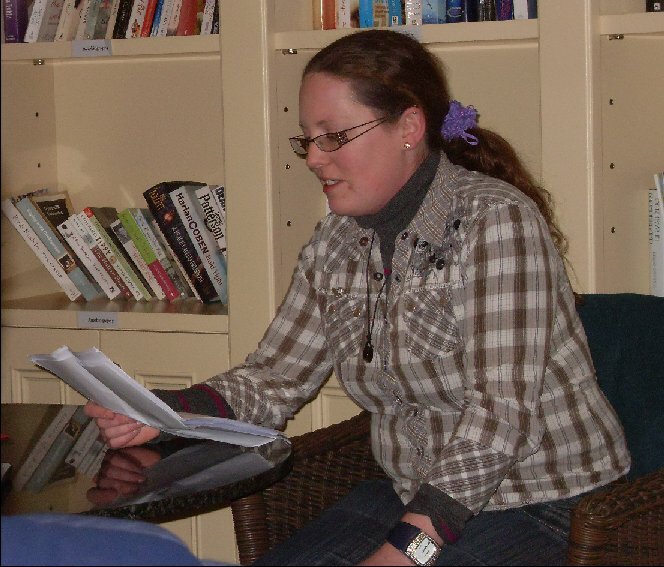 Connie recently won the Patrick Kavanagh and Dromineer poetry competitions (picture right) and must be close to having her first collection published. Don't we look happy! The victorious Boyne Writers Group team after winning back the Battle of the Books trophy from the local rivals, Meath Writers Circle, last Sunday at the Trim Swift Festival. another happy photo on our website. 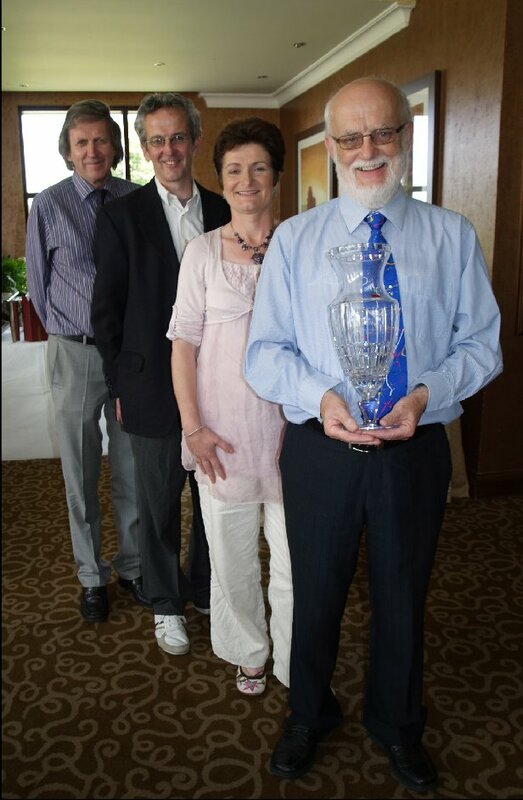 From the back: Bill Comerford, James Linnane, Caroline Carey Finn and Michael Farry. It's a nice trophy presented by Noel Dempsey, pity it's hiding my satire tie which probably gained me an extra mark or two on the day. Some comments by members of the opposition on blogs, Tommy Murray here and Frank Murphy here including some generous compliments, thanks. I'm not going to get into a debate about satire and judging but exceeding the time limit was something we were determined to avoid having lost points two years ago for that. It's the backlash next year I'm worried about! Labels: Boyne Writers Group; Trim Swift Festival; Meath Writers Circle. We are delighted that one of our members, Orla Fay, has been chosen to take part in tomorrow evening's The Lonely Voice: Short Story Introductions in the Irish Writers Centre at 7.00pm. Orla is better know as a poet having been published widely in magazines and commended and highly commended in poetry competitions. We have heard Orla read some of her prose at our meetings and we know that one of her aims is to write a novel so we're delighted at this honour. PIcture: Orla reading at a Boyne Reading and Open Mic. The Lonely Voice Short Story readings in the Irish Writers Centre, Dublin will take place on Wednesday, 6th July, at 7pm. The readers are Sarah Gilmartin, Deirdre McClay, Orla Fay and Guy Barriscale, reading from their winning stories. The readers were selected anonymously by guest judge Leo Cullen. 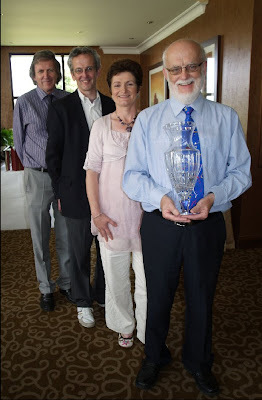 Boyne Writers Group won the Battle of the Books today in the Trim Castle Hotel so the Noel Dempsey trophy is back with us after a year's absence. A strangely anti-climatic contest but still great to win. The opposition, Meath Writers Circle, made a great start with Mark Doyle reading a wonderfully clever story mixing ancient legend with modern technology. Unfortunately he went over the time limit of five minutes and lost marks. Their next contestant also infringed the time limit and with our openers scoring solidly all we had to do was keep our heads. We did and we won easily in the end. Ours was a great team performance with three members scoring identical marks. James Linnane started with, O Come to Ireland, what one of the judges called an angry look at modern Ireland. Caroline Finn likewise took a swipe at the state of the country through Micheál Martin on a bus planning scrap metal collections for China. My piece was an amendment of the 1916 proclamation in the light of political correctness and the indebtedness of the country. Bill Comerford had a poem of rhyming couplets in which Prince Charles has a dream that the Queen's Irish itinerary has been planned to maximise the possibility of her being harmed and his becoming king. Some debate about what is satire, not easy to define but relatively easy to recognise. So the score after three years' Battle of the Book contests is Boyne Writers - 2, Meath Writers Circle - 1. Day two, or is it three, of the Swift Festival. The reading of Gulliver's Travels is progressing well and it should be finished tomorrow before three o'clock at which time the Battle of the Books is to take place. Among the readers today was Irish Times columnist John Waters, pictured above with listener Joe Barry who himself was a prizewinner in our satire competition a year or two ago and is a contributor to the Farming Independent. The free satire marquee beside Trim Castle had performances from noon to 8pm and seemed to be crowded all day. Trim Drama Society kept the Poetry in Motion going and found many willing readers among the public. I attended only two lectures at the conference today both to do with graveyards. Greg Hastings gave a fascinating account of a unusual mausoleum in Castlerickard churchyard, Co Meath entitled The Esquire, his Wife, her Lover and the Mausoleum. The mausoleum contains the remains of Godwin Swift (d. 1814) and his wife Jane Sophia (d. 1851). These were distant cousins of Jonathan Swift. This was followed by Fionnuala Parnell's discussion of the eighteenth century headstones of Dublin, Meath and Louth in which she pointed out the importance of these items and the sort of information they contain and made a plea for their better preservation. And now rest and preparation for the Battle of the Books. I met the captain of the other team today and the happy smile he wore suggests that their secret weapon is in place and their confidence is high. We of course have resigned ourselves to defeat this year but next year - now that's another matter! In the satire marquee today I got a brilliant idea for my piece next year. Lots of pictures from the festival launch here. I'm hoarse. This reading poetry on a soap box in the street is hard on the vocal cords. You have a choice, read quietly hoping that no-one will notice or give it all you've got so that the person at the cash machine half way down the street turns round to see what's up. I favour the latter - let it rip. 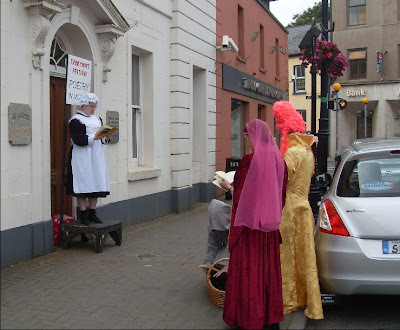 A good gang of readers entertained the indifferent and interested today on the streets of Trim with all kinds of poetry, Yeats to Wordsworth. Paddy Smith kicked off with This is Just to Say by William Carlos Williams chosen I think because of its brevity. Members of Trim Drama society took part in their wonderful costumes which got as much attention as the poetry. Picture above. Then there was the marathon reading of Gulliver's Travels in a Suzuki Swift car in the main street of Trim. Noel French, president of the Chamber of Commerce, was the first reader. Picture below: Noel just about to enter the car. By the end of the day the Travels had reached Brobdingnag. 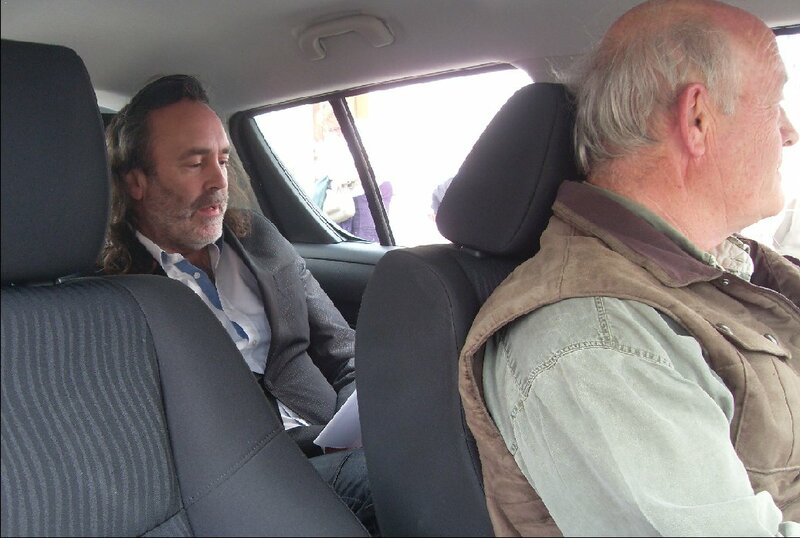 Paddy's list of 93 readers is full but listeners who pay two euro to sit in the car and listen are still welcome. Indeed if you are anxious to read come along and Paddy will probably squeeze you in. All proceeds to Aware. I only got the chance to attend two talks in the Eighteenth Century Ireland Society Conference which is being held in conjunction with the festival. 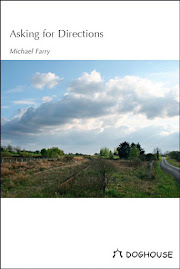 Both were about the development of the novel in eighteenth century Ireland. Lucy Cogan talked about women novelists including Sarah Butler who wrote Irish Tales (1716) an historical fiction about Brian Boru which may be a Jacobite version of recent Irish history and Dorothea Du Bois who wrote Theodora (1770), a fictionalised autobiography, to put hers and her mother's side of a notorious scandal of the time. Moyra Haslett talked about the rise of the Irish novel especially dealing with the works of Richard Head. She speculated about the influence of his work on Gulliver's Travels. An appreciative, knowledgeable audience including the ubiquitous Dr. James Ward. It was obvious from questions and discussions that I was the only one in the room who never heard of any of these three. It was also obvious that there are lively academic debates about what constitutes a novel, what can claim to be the first Irish novel, is Gulliver's Travel a novel and is publishing by subscription real publishing. Great stuff. I immediately felt like going online and ordering some of the novels mentioned but . . . I have a book to finish. Something else to add to the TO DO WHEN THE BOOK IS FINISHED list. And there's more tomorrow! Check the website. 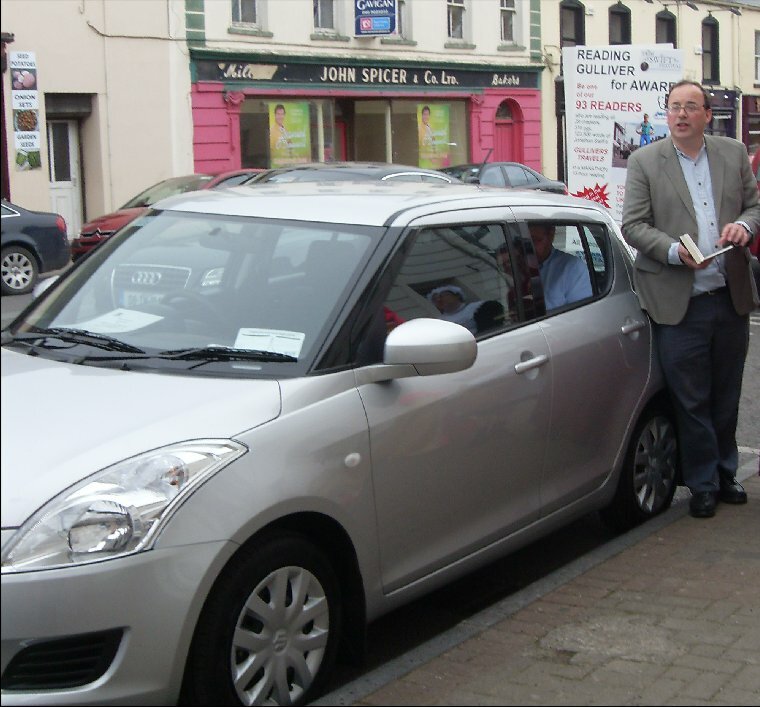 The 2011 Trim Swift Festival was launched last night in the usual great style. An "authentic" eighteenth century style Samba band paraded the streets of Trim and Dr. James Ward of the University of Ulster spoke about Swift, Jedward, mobile phone speak, the death of literacy, the relevance of Swift, questioning everything and overeducated academics. The winner of the Boyne Writers Satire competition, Elizabeth Power from Galway, was presented with her prize and she read her winning entry. Third placed Margaret Costello from Drogheda was also there. The three winning entries have been added to the contest page here. Picture: Elizabeth with Paddy Smith, Boyne Writers chairman and member of the Trim Swift committee. Ex-minister Noel Dempsey said politicians and satirists had much in common, each wanted to change the world and the efforts of each always ended in failure. He begged present day satirists to leave politicians alone for a while and instead attack economists who have been no help in the present crisis and continually give contradictory advice. Unlikely to happen he thought. He complimented Trim on the number of events and festivals held during the summer but said that the Swift Festival was the one most likely to give us a laugh during these times. We had a laugh or two later in the Priory Pub where the Stand Up Row took place. This is the contest where speakers have to speak for one minute on one side of an argument then change sides and speak for another minute. Great fun and the judges including the aforementioned Dr. James Ward added to the fun with their comments. Kiely's Pub won the team event and Vinnie O'Brien, (a past pupil!) the individual contest. Phew! Today there's the Gulliver's Travels Reading in the Suzuki Swift, Poetry in Motion street readings, Day 1 of the academic conference and tonight the Round Table Discussion with Rory Bremner, George Hook, John Waters, Leo Varadkar, Pat Rabbitte etc etc. And it's only Friday!